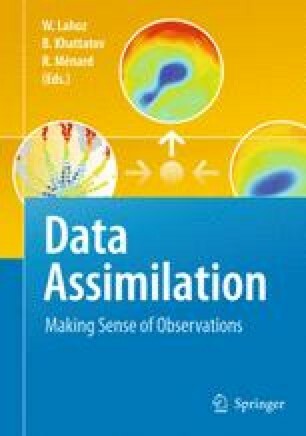 The application of data assimilation methodology to terrestrial problems in meteorology, atmospheric physics and physical oceanography has already been described extensively within this book. Data assimilation, the combination of observations and numerical models which provide physical constraints, organize and propagate the observational information which is introduced, also offers significant potential advantages for the analysis of atmospheric data from other planets. The Solar System provides seven examples of thick neutral atmospheres in addition to that of the Earth: Mars, Venus and Saturn’s moon Titan, which all have relatively large rocky cores surrounded by thinner atmospheres, like the Earth, and four largely gaseous Giant Planets, Jupiter, Saturn, Uranus and Neptune. In recent years satellites have been placed in orbit about Mars in particular, but also Venus, Jupiter and Saturn, in contrast to the relatively rapid fly-by missions in the initial stages of the exploration of the Solar System. The author is grateful to W. Gregory Lawson for his insightful comments on the first draft of this chapter.